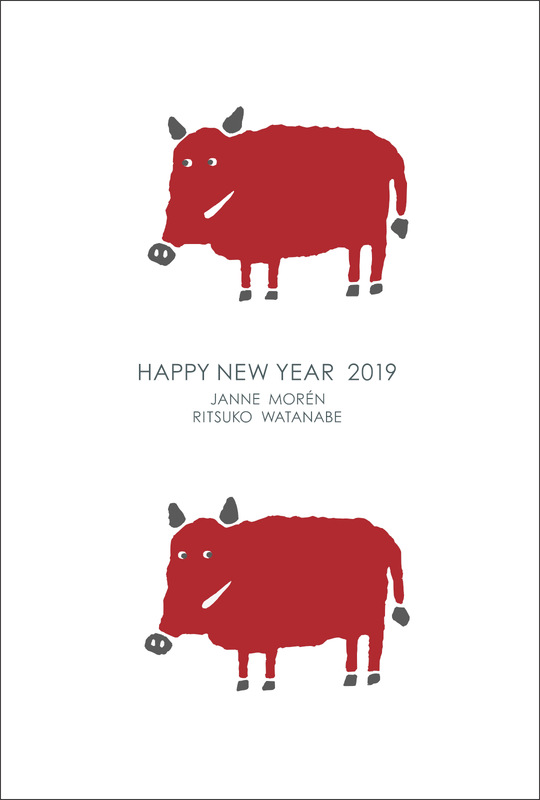 Happy New Year from Janne and Ritsuko! After weeks of gray, rainy weather we finally had a wonderful saturday with 19°C, no wind, and not a cloud in the clear blue sky. 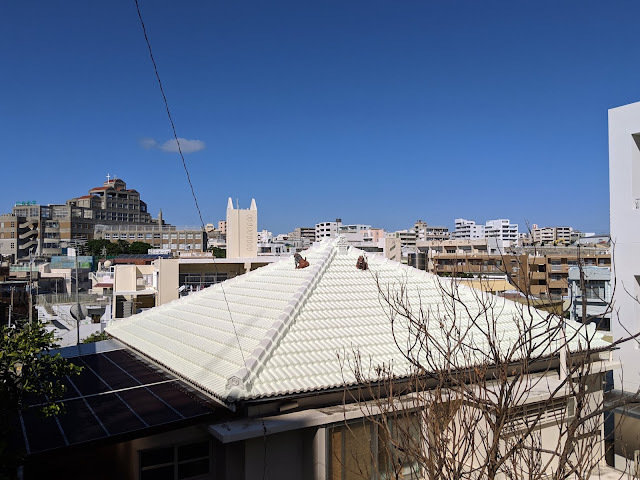 I've recently extended my long run to about 15km, and there's a fun route from Naha city hall up to Shuri castle; through Sueyoshi park, then down towards the sea; cross road 58, then follow the coast back to Naminoue, and finally back to the city center. Before going out on my run, I started on some bagels. 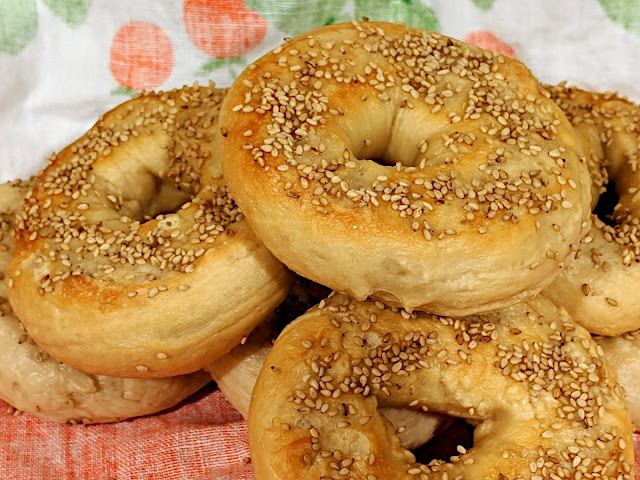 Bagels aren't all that difficult to make; no sour-dough starter or wood-fired ovens needed. 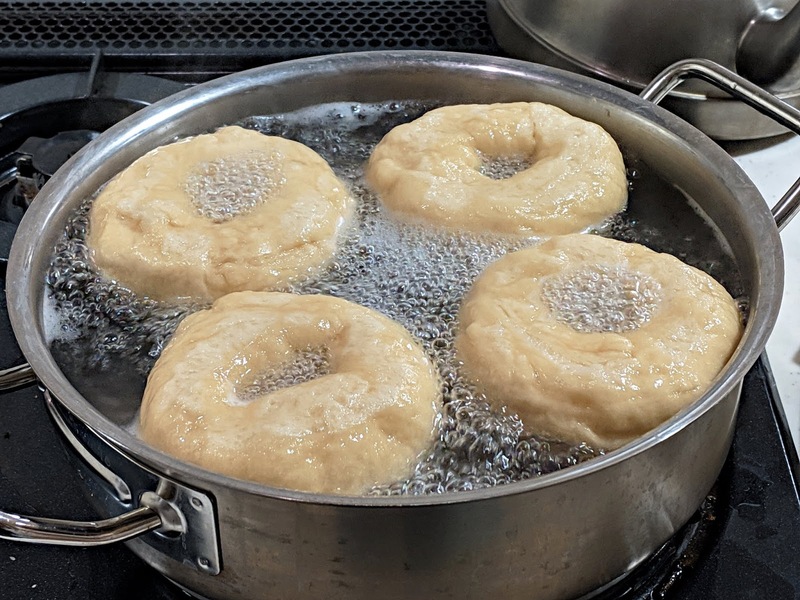 The main points are to make a fairly dry dough (50-55% liquid); to let them rise slowly at low temperature over several hours; and boil them just before you bake. I made the dough and left it to rise while I went running. I started running through Naha, but no more than 3km away I managed to completely miss a curb as I was taking a picture, and twisted my ankle. I had no choice but to abandon my run and limp back home. The offending picture. Not much to lose a running day over, to be honest. Once back, I iced my ankle, then shaped the bagels and left them in the fridge to slowly proof over several hours. Ritsuko is in Osaka this weekend, so sitting at home is no fun. Fortunately, December 15 is the opening day for the all-new Okinawa Prefectural library, and it's a stone's throw away from home, in the new bus terminal building. I walked limped over to the bus terminal building. 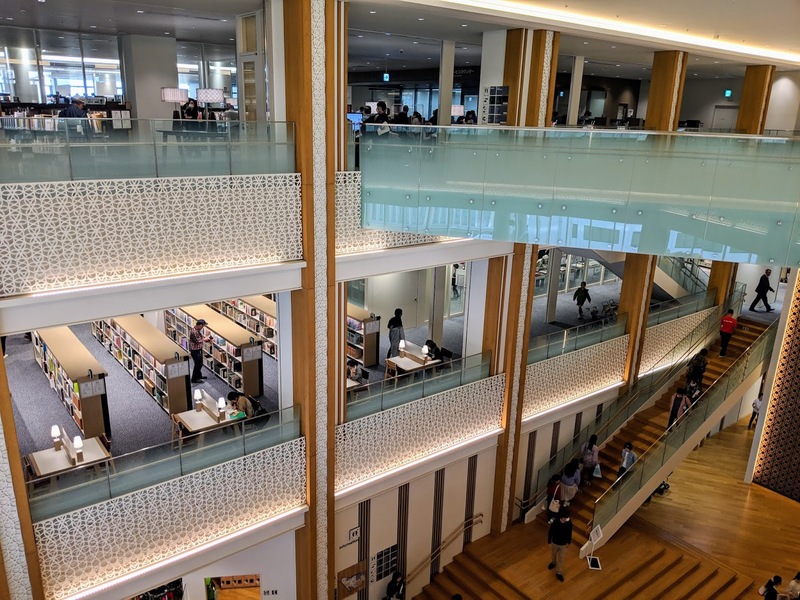 The library itself is surprisingly large — the public areas are spread out over three spacious floors, and there's a massive storage area for books with a robotic train delivery system. I never realized it before, but the bus terminal building is really mostly a library; the shopping mall is just sort of squeezed into the leftover space. 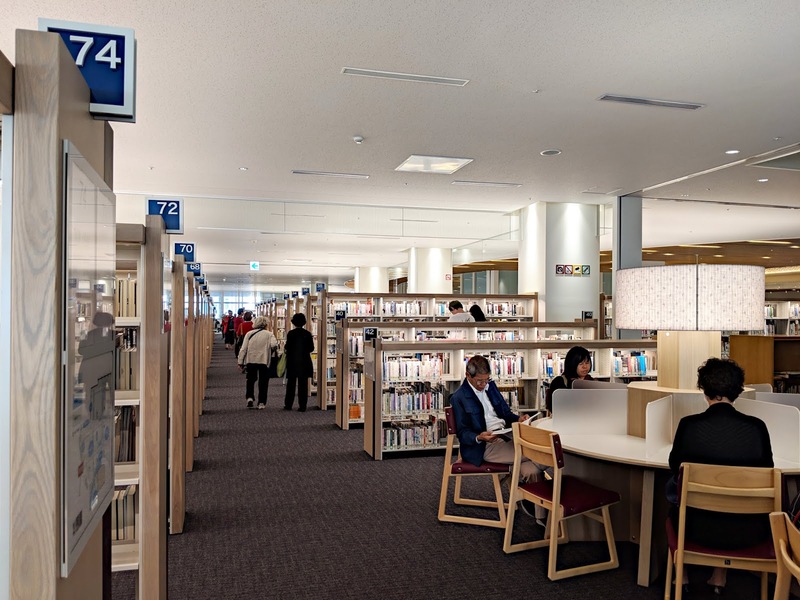 The library is large, spacious and well-designed. Reading desks with a view. 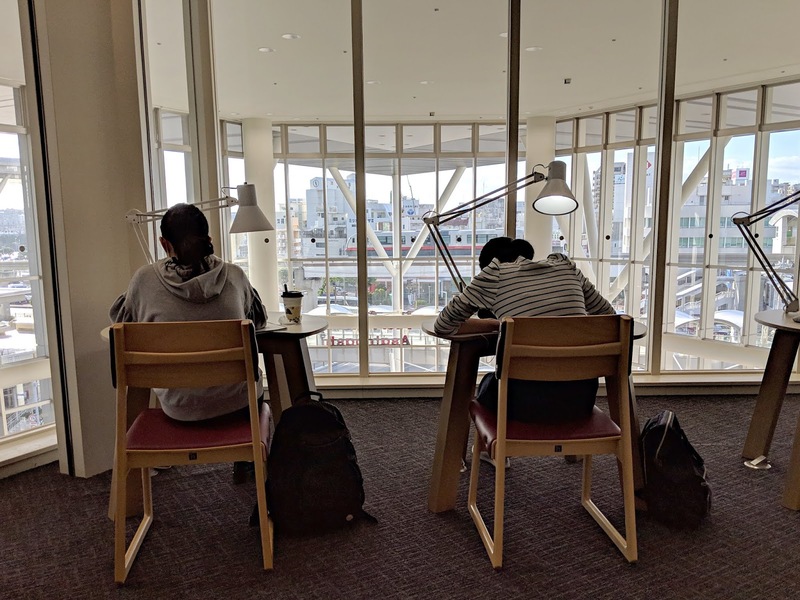 The most surprising thing for me was perhaps that only a few hours after the library opened for the very first time, there were hundreds of people there doing homework, reading magazines or studying just as if they'd been doing it there for years. I really think there is something about libraries, specifically, that make them so very amenable as communal spaces like this. I thought that I might as well get a library card while I'm there. Apparently, about half of southern Okinawa had the same idea. I spent two hours in line waiting to get my card. Amusingly, many of the people waiting in line were sunk deep into a book as they were waiting. In most other situations everybody would have been fondling a smartphone. This is a great library. Lots of volumes, lots of reading seats, open and airy. I may have a serious crush on this place right now — please don't tell my wife. Once back home, I brought out the bagels again. Put a wide pot on the stove, pre-heated the oven, then made bagels. Boil the bagels. This, along with the low liquid content in the dough, is what effectively gives them the chewy texture. ~45 seconds, flip them, then another 45 seconds or so. Finished. Unfortunately, the oven I have can't really do the kind of temperatures needed for breads like this. Still, they turn out pretty good. In all, a pretty good saturday here in Naha. I'll have a bagel for breakfast tomorrow (ham, cream cheese, lettuce, red onion and mayonnaise, I think), and freeze the rest for later. And my ankle feels much better already; with any luck I'll be able to go on a short run tomorrow. This was the first time in New York for both me and Ritsuko, and, the first time I've visited USA on holiday. I've gone a few times for work — I was in Denver last year for the Supercomputing 2017 (SC17) conference and I'm going to Dallas for SC18 next week — But that's not really the same as going to a place of your choice just for fun. As usual, this blog post is really mostly an excuse to post pictures from our trip. If you feel I'm excessively wordy, feel free to just look at the pictures. That's what this post is for anyway. Why New York? Because we love big cities. We love living in them, and we love travelling to them. New York is of course an iconic metropolis so it's long been a future target for us. We did what we usually do: walk around, watch people, and eat. And as I've started running, I also ran almost every morning. New York is far from Okinawa. It's a 13 hour time difference, so almost exactly on the other side of the northern hemisphere. There's no direct flights, so we took an Asiana (the airline famous for the "nut incident") 2-hour flight from Naha, Okinawa to Incheon in Korea; a short overnight stay at the airport; then a 14-hour morning flight from Incheon to New York. 14 hours is a long, long time to spend in an airplane. Fortunately they fly the Airbus 350 along that route, and they are so big and stable, so quiet and with such good air that it's really quite comfortable despite the many hours. They're so quiet in fact that I didn't even bother using my noise-cancelling earphones for most of the trip. A good experience. Victoria's Secret. The shop design is very over the top and fun to visit even if you have no intention to buy frilly underwear. Less good was Incheon airport itself. There's really not much to do there, other than look through the few tax-free shops (each of which are copy-pasted multiple times throughout the airport). Worse, the airport has an iron-clad rule that you can only access the lounges and actually buy anything in the shops the same day you fly out. We had an entire evening we could spend only sitting in the waiting areas or at the disorganized, crowded food court. Anyway, we arrived remarkably refreshed at JFK airport. I had an ESTA visa from last year so I could use the self-check machines, but Ritsuko had to wait in the agonizingly slow manual processing line for an hour and a half before she was finally extruded from the rumpled mass of discombobulated travellers. Easiest way from the airport is with a taxi. It's not the cheapest but it's by far the most convenient. The price is fixed, so you know exactly how much you'll pay (you can easily pay more for an Uber than for the taxi if you travel during rush hour or the weather is bad). And you don't have to find your way to your hotel from some bus stop or station. A yellow cab. And a woman in red. In New York itself you want to use the subway. It's fast, convenient and remarkably inexpensive. Get a subway card, then recharge it now and again. The subway itself is old but fairly neat — a far cry from the way it's sometimes portrayed in movies. Manhattan is almost small enough that you can walk if you feel like it. If you're just going 2-3 stops it's likely faster and more fun to walk. With the grid layout it's really easy to know where you are; you'd really have to work on it to get lost. Platform on 59th street. On our way to Central Park. We travel for food. Really - we pick our vacation spots at least in part by what we can eat when we get there. There's lots of restaurants in New York, at most price levels, with food from many places around the world. But it's expensive, and you usually get way too much of it. A co-worker from New York recommended "Murray's Bagels." As it happened it was just down the street from our hotel. It certainly was excellent - fresh, tasty bagels with a large list of fillings. I had smoked fish, lettuce and cream cheese, while Ritsuko got a BLT. But even this was really too much. We went there for Saturday brunch (a mistake; people were lining up out onto the street) so we were plenty hungry, but I still only managed to eat my entire bagel, while Ritsuko was unable to finish hers. And at almost $15 with a coffee, it really isn't great value for money, as tasty as it may be. We ate out many times during the trip, of course, but we hardly ever managed to actually finish our meals. We'd order just a single thing on the menu and we still had to leave half uneaten. Leaving food feels, to me, impolite and wasteful. We had Indonesian food for lunch in a family-run restaurant, and my chicken and rice had so much food - basically half a chicken on a mountain of rice - that I left most of it. When the waitress, who was Indonesian, came to take it away I apologized. She laughed, nodded and said "Yes, American-sized". Detroit pizza was delicious. Very thick and baked in a rectangular oven pan. We'd buy one pizza (the vodka sauce was my favourite) then some salad from a deli and call it dinner. Food is quite expensive, especially the "cheap" food. A sandwich and a cup of soup, or a bagel and coffee, cost 15 dollars - that's 1800 yen! In Japan that would buy you a real set meal with drink, dessert and coffee. That said, not everything is expensive - many pizza places have a "2 slices + drink" for around 3 dollars, and it's really popular. An outdoor cafe and lunch place. All restaurants in New York have to display their hygiene rating. "A", as here, means there's no major problems. A "B" is indicates some kind of more serious problem, and some people will avoid eating there. You don't want to eat at any place with a worse health rating than that. A good system, I think; it forces even food carts and kiosks to take such things seriously. For dinner we usually got something from a deli and brought back to our hotel. That solved the "too much food" problem. We try to take a cooking class wherever we go. 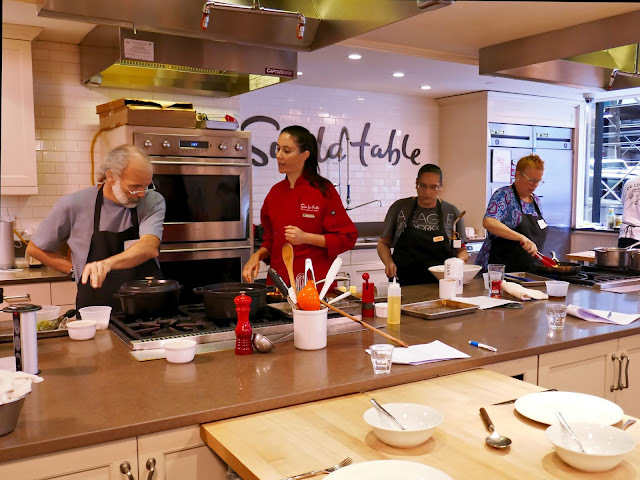 This time we went to "Sur la Table", a kitchen-ware shop with a sideline in cooking classes. We try to learn about food from the country we're visiting, so we picked a cajun cooking class. Sur la Table. Good cooking classes. It was fun, and one of the better classes we've attended so far. The menu was simple and short enough to not become stressful: chicken and sausage gumbo; garlic shrimp with grits; and banana flambé. All three dishes were quite simple but still interesting enough to be fun to cook. Cooking class in action. The teacher in center, and I'm the white-haired guy on the left (I look old! When did that happen!?). This is what the class is like: neat, well-planned and professional. Picture by Ritsuko. The teacher was professional, clear and unhurried, and managed to keep the small class (only four of us) moving ahead at a brisk clip. If there's anything to criticise it's perhaps that the short class time — just two hours — left us with little time to eat; we really had to hurry before the end of the class. The bananas were fine. The garlic shrimp was really tasty, and I'd like to try them with couscous someday (grits are not easy to find here - I've never seen it). They should work fine on their own as a side dish of course. Chicken and sausage gumbo. It doesn't look like much (stews generally don't) but it was full of smells and flavours that played off of each other. The earthy roux, the spicy sausage, all the savoury notes from the meats and tomatoes, the thick, satisfying texture from the rendered vegetables and okra. I like this a lot. We had it with rice which is fine. At home we also tried couscous and that works well too. Our favourite so far, though, is mashed potatoes. The dry, creamy mash and the soupy, spicy gumbo go together really well. The gumbo is a hit — easy, low-stress food that you can vary endlessly with different ingredients. The keypoints are the stock veggies (onion, green paprika and celery); okra for thickening; and the roux. The flour and oil has to be slowly heated until it's a rich, dark chocolate colour — stop right before it's starts to actually burn. Fry the meat, add stock, then the rest of the ingredients, with the sliced okra towards the end. The okra thickens the stew very nicely. We've made a large pot twice at home already, enough for 2-3 meals. As with most stews it actually tastes better if you cool it and let it sit for a day before you eat. This is a hit. So, the hotel... The building is cool: a former five story single family home, converted into a boutique hotel with about a dozen rooms in total. The building and the rooms have kept much of the original interior style, and is quite atmospheric if not always so convenient. Our bedroom. Quite cool. And I didn't realize that window-sill air conditioners not just still exists, but is the standard way of installing them here. Some buildings even have rectangular openings in the facade below the windows for the AC. You'd think separated units would be a thing by now. But. The owner or manager (I honestly don't know which). Every morning he would come out at breakfast, walk from table to table to greet the guests, ask about their plans for the day, give a bit of advice and so on. Except for us. He'd simply skip our table without saying a word. He didn't greet us in the hallway or talk with us about anything. When we checked in he just gave us the room number and key without offering to show us the room. If I asked him direct questions he would answer them. But even when Ritsuko was standing right in front of him and said good morning, he'd just turn away from her and walk away. I guess perhaps Japanese are not his favourite people; he is certainly not one of ours. I can't recommend staying at this hotel. It's a shame; the atmosphere was nice, the guests were pleasant and the cleaning staff was friendly and talkative (and a lot more helpful than the manager). We don't really do sightseeing much, but of course we visit the occasional interesting-looking place. No interest at all in historical places, but interesting buildings, good people-watching places and (of course) food-related places can be fun. The reading room at the New York City library. The New York City Library is, indeed, fun. It's a spectacular piece of architecture, and it's a fully working library. That's not without its problems since it's also overfull with tourists (like us) come to see the building itself. The library solves it by roping off sections for people to gawk and take pictures, while other areas are reserved only for people that use it as a library. A librarian engrossed in what appeared to be a Youtube video. The actual library stacks, by the way, are all underground, and there's a neat train system for ordering and bringing up books from storage to the large reading rooms. I would liked to have learned much more about this automated system. Fifth Avenue from the library windows. The Metropolitan Museum was, on the other hand, not that fun. The problem is that it's huge; the collections feel fragmented; and there's little support to make sense of it all, or even find out what's currently being shown. The museum seems to really be a collection of small galleries, each with its own exhibition sponsored by some rich person or another (seems much of the art and culture here are driven by conspicuous donations, rather than public money), and there doesn't seem to be much coordination between exhibits. In a small gallery we found an exhibition of early 20th century portraits of black Americans, most of them unknown. It was a fascinating exhibition, and we stumbled on it only by accident. The gallery was right next to a hallway containing some paintings and statues by Rodin. There was no connection between them that I could discern. Watching people is as much fun as watching the exhibits. In the end we spent just 3 hours or so in there before we gave up. If you live in New York and can visit repeatedly the layout and organization will perhaps start to make sense. For us it didn't. The stairs outside the museum are more enjoyable than the museum itself. Very good place to watch people being people. Staten Island ferry is what you want to use if you want pictures of Wall Street or the Statue of liberty. It's a free passenger ferry between the southern tip of Manhattan and Staten Island. It takes twenty minutes or so, and you have great views of the harbour, the statue and the Wall Street skyline. Don't bother going to the actual statue itself — apparently the view is worse and you're not allowed inside the statue anyway. The Staten Island ferry gives you some very good views of south Manhattan. Toward the northwest from the ferry landing you have the new World trade center, the memorial and some large shopping arcades. Brooklyn Bridge is best seen from Manhattan bridge to the north. We took the subway to York Street on the Brooklyn side, then walked up on Manhattan bridge for the view and some pictures. Walked back down and to the small park between the bridges where we had coffee, then walked back to the Manhattan side over Brooklyn bridge itself. On the Brooklyn side some old warehouses have been converted to shopping malls. A furniture store on the bottom floor sells coffee, but the restaurants were a little too formal for a quick lunch. The bridge is cool but full of people, up to and including several couples in wedding dress getting their pictures taken. I don't recommend trying to run or bicycle across it during the day; it wouldn't be much fun. The next time I think I'll just skip Brooklyn bridge and cross the Manhattan bridge instead. You get a good view over the harbour from the bridge. Central Park is, well, both very central and very park. It is an oasis in the city center, if a rather busy one, filled with touts, tourists (guilty as charged), families, pensioners, joggers, newlyweds and just about everyone else. And I can see this being a less than safe place at night. Very serene. This was a photo shoot, probably for some commercial. It's a refreshing, sometimes serene place, and it's popular for good reason. If you take small side paths there's few people around even in the middle of the day. Runners of the elderly persuasion in Central Park. I went running almost every morning. It's a nice way to see parts of a new city. It's also a surprisingly effective way to reduce the effects of jetlag. You're still jetlagged of course but it really helped me to wake up and get going in the morning. Morning run in Manhattan. By 8:40 there's already plenty of people around; the sidewalks are wide but it's a good idea to run earlier if you can. People really are very forgiving to joggers and runners. These guys were trying to work, and instead of getting irritated at 3-4 people all trying to stick with their pace they just smiled and laughed it off. Manhattan is both good and bad for running. It's flat, people are used to joggers and runners, and the sidewalks are wide enough to accommodate both joggers and pedestrians. The grid layout makes it easy to find your way. On the other hand you have red lights everywhere, so it's difficult to get a continuous run, especially if you try to go north-south. Still, you can run as long as you're a little creative and let the green lights guide which way you go. A rainy morning at 07:30. Much fewer people and much cooler. One excellent place for running is along Hudson River and the High Line Park to the west. There's running and walking paths all along the river, and the High Line is a former elevated railway converted to a long (~2.2km) and very narrow park. I usually ran to the seaside, up along the river to the High Line start, down along the High Line and back to the hotel. It's a nice 6-7km morning route. The High Line looking northwards. The north end of the High Line. A rail yard and a small industrial area. I wish the weather had been better. I did run Central Park once. We took the subway to the park as it's a bit too far to walk. I ran the full outer route (10km) while Ritsuko was browsing nearby stores. It is indeed a really good place for a run. It's mostly flat, and there's plenty of bathrooms and water fountains around - you don't need to bring water or anything. It did feel a bit impolite to take the subway back, even though I'd cooled off already, and I saw plenty of other people do the same. Most of the outer route is popular with cyclists as well as runners. This is near the north turnaround. Skateboards were insanely popular, even among older people. The weather wasn't all that great, but on one sunny day we took a trip down to the southern end of Brooklyn and Coney Island. The subway effectively reaches from Manhattan, down through Brooklyn, all the way down to Brighton Beach and Coney Island at the southern end. It takes 50 minutes, but costs no more than travelling a single station in Manhattan. I understand this is important for commuters, but I almost felt bad paying so little for the trip. Coney island. In the background the apartment buildings of Brighton Beach. Coney Island itself is a long sand beach with an amusement park and some piers. A colleague warned me that the beach and the ocean will be underwhelming compared to Okinawa (and he's not wrong), but on it's own terms it's still a very pleasant open air area close to the city, and it's well worth a visit. The area is home to many Russian immigrants, and a lot of signs and information are still written in cyrillic. The beach was quite busy, although only a few people were swimming. Coney island is home to an old amusement park, a beach and a long boardwalk. There were quite a lot of people around even this late in the season; it was probably the last chance to enjoy a day of sunshine on the beach before autumn set in for real. A day out in the sun. We spent the day along the boardwalk, watching people and the rides, and just generally enjoying the sea and sunshine. For lunch we picked a Russian deli near the beach. The menus were all in cyrillic so we picked a few items (filled pirogs, mostly) at random and ate in a nearby park. Delicious. New York has been one of my favourite trips so far. There's lots to see, lots to do, and it's easy to get around. It's very people-friendly city in many ways. Now that we've been here once we know what to expect. The next time we'll try a few more offbeat things, and also spend more time just watching people instead of moving around. It feels like a very good city for that. On our way back to the airport. We get stuck in traffic, so our taxi driver here jumps out to get a sandwich and a cup of coffee. I certainly don't begrudge him that. And, well, he did manage to get back before too many people behind us started honking. Our way back was supposed to mirror the travel out: a 14 hour flight from New York to Incheon arriving in the afternoon, then a flight back to Okinawa early the next morning. Unfortunately, Typhoon #24 decided differently. It passed by Okinawa the same morning, and our flight back from Korea was cancelled even before we left New York. We got rebooked on a different flight on the afternoon of the following day, which meant we had to spend two nights in Korea. On the positive side, we got to spend two nights in Korea! Neither of us had ever been there before. We got a cheap hotel room next to the airport itself and had an improvised dinner of bento and sandwiches from a small convenience store nearby. Bibimbap for lunch at a market near the station. The next morning we took the airport train to Seoul. Seoul is, of course, another of the big cities of the world and a single unplanned day is not going to do it any kind of justice. We spent the day walking around, with lunch at a market then dinner at the train station before we returned to the airport and to our hotel. We should probably make a real trip to Korea some day. I don't know why, but there were a lot of more or less reality-challenged people around in Seoul the day we visited. This lady had apparently decided that RFID is the mark of satan, and made it her mission to tell everyone at a busy street corner. There were a couple of tents with apocalyptic-sounding Christian preachers in front of the station, along with a woman from Tenri-kyo (a Japanese Buddhist sect) that just played endless recordings of sutras (she was still there when we returned at night). We kept running into individuals like this all day long. There seemed to be some kind of war-related anniversary when we visited, with a demonstration and some gatherings. Some of the participants certainly seemed to belong to the rightward end of whatever political or social spectrum you care to imagine. I couldn't read most signs of course, but one person had a sign in English effectively saying that "global warming" is a communist lie to destabilize the economies of south Korea and USA. It's quite possible this event was the reason for a lot of the feverish cult-like activity I mentioned above as well. Seoul is located among some very beautiful mountains. It feels as if you could just walk up to the end of the street and start climbing. Dinner: sliced fried meat, pickles and bean-sprouts that you wrap in a lettuce leaf. You get a whole set of leaves with different sizes and tastes. This is good stuff. A long trip, and a long, long blog post. I apologize for that. A big thank you for reading this far (or at least for glancing at the pictures).